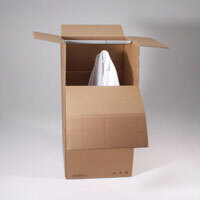 Wardrobe Cartons allow for easy packing and storage of garments that can be hung on a wardrobe bar. Front flap folds out for easy loading/unloading. Hand holes for comfortable lifting and carrying. Printed for easy identification of contents.